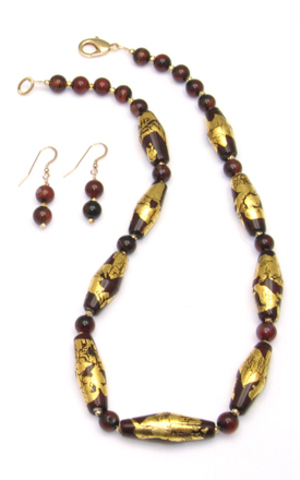 The nine handmade beads featured in this set are a combination of a dark red-brown glass partially covered with 24kt gold leaf. The necklace is strung on 19 strand, 24 karat gold plated, stainless wire encased in nylon. This excellent product made by SoftFlex provides exceptional strength while maintaining flexibility. 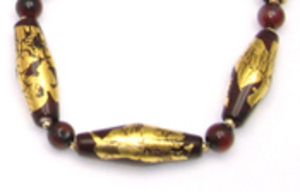 The handmade beads are complemented with round carnelian beads and hammered gold vermeil beads.